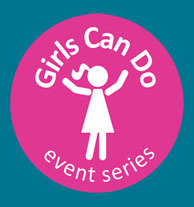 Girls Can Do – Because She Could, So I can Too! 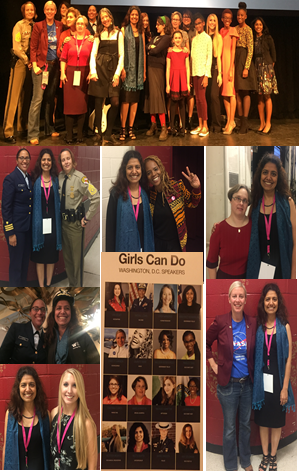 By Girls Can Do Washington DC Speaker, Reetu Gupta. Sometimes life goes into a high gear and you are leap frogged to a new level in matter of couple of days. For me, last weekend was one such time. This was life on steroids! I was invited to speak at an event in Washington DC. Event was organized by a non-profit organization, called “Girls-Can-Do”, dedicated to helping girls feel empowered and confident that girls can do whatever they want to. Initially when I was invited, I felt a huge honor. I felt thrilled to share my story with 2000 girls even though I was not sure if I had too motivating story. But I looked at it as an opportunity to help girls, which is the biggest cause I care about. I went to inspire other girls but I had never ever imagined, even in my wildest dreams that I will come out inspired, more than anyone. Olympics, White House staff, humanitarian, Musician, including middle and high school girls who do DJ, collect books focusing on black history and write apps to help other kids. This was the best collection of highly accomplished girls and women under one roof. And they came to share their true honest story. Story of being scared but still pushing through, story of self-doubt but still accomplishing, story of constraints but still thriving. I met Natalie, a high school girl, who was bullied for years and instead of giving up, she created an app to help other kids who get bullied. I met Diane who let go of her 6 years of college to follow her passion of being a law enforcement officer. I met Angela who earned gold medal in para-Olympics and showed to non-believers that we all define our own success criterion. I met Christy who now designs spacesuit for NASA in spite of the fact that someone told her that she didn’t look like an engineer. I met Divinity who played Base for Beyoncé while following her passion for base. I met Rachel who risks her life every time she steps on a ship as a coast guard officer. I met Linda who is helping with education of under privileged kids. I met Lisa who works on national policies for Canada regarding indigenous people. And I met three women working at white house with policy making related to education. All these women responded to naysayers with their success. All these women believed in “success is the best revenge.” I got to laugh with these women and cry too. We hugged each other over and over again. And now there is a bond connecting all our hearts. I got to know these amazing women from all over the country. Suddenly I feel my universe is bigger. Who knew that I’ll come out inspired beyond any measures. I got to learn from their stories and also got validation for my story. I got to share my personal story — a story that had not seen a daylight till now. It was humbling that right after I got off the stage, a girl came running to me and hugged me and told me how my story was inspirational to her. As event ended, two women from a local organization invited me to spend a day with their girls! It was such a humbling experience.